Probably northeast of Cërrik. The location is taken from TPC maps. It cannot be clearly identified on Google Earth. 6 km east-southeast of Tirana city center. 13 km north-northwest of Lezhë, northeast of Gjadër. At its southern end, runway 17/35 changes into a taxiway, which crosses the river Drin with a bridge. It leads to an underground aircraft storage. Garat ne Gjader, Racing in Albania - Video about car racing at the Gjadër airbase. 4 km northwest of Korçë city center. 4 km south-southwest of Kuçova. Runway 09/27 ends in the east at an underground aircraft storage. MiG-15bis in the underground storage. MiG-15UTI in the underground storage. Shenyang F-5 in the underground storage. 5 km south-southwest of Kukës. 6 km northeast of Shkodër city center. Formerly in front of the northwestern city limits; it seems that the city was extended to this area over the last years. An AS-350B Ecureuil at the former airfield, new houses in the background. 12 km northwest of Tirana city center. Joint use as airbase and international airport. 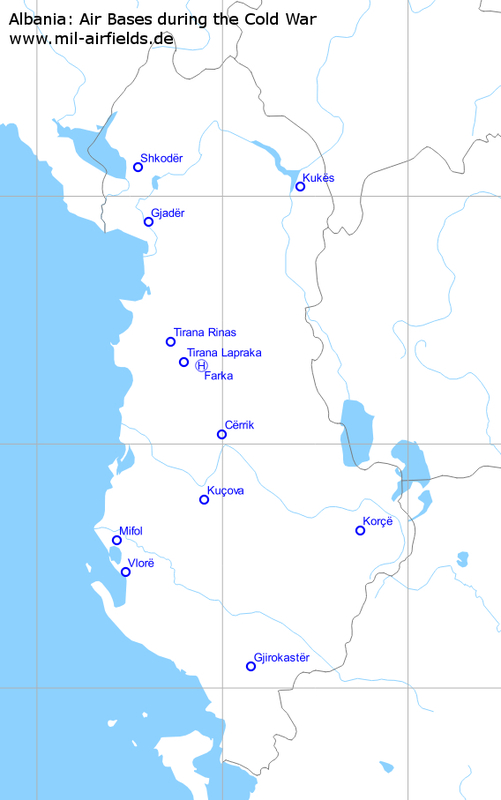 Internet sources mention three more airfields: Island of Sazan, Orishti and Shijak. Island of Sezan: I could not identify any airfield installation on Google Earth. It seems that the topography of the island is generally unsuitable to build an airfield. I cannot find a location named Orishti. Obviously, the other sources have the same problem. In the area of Shijak, I could not identify any airfield. According to a US map from the year (ca.) 1960, there was an airfield southwest of Shijak, between the road Salmanaj-Rreth and the river Erzen, approximately at N4120 E01933. But Google Earth and other satellite pictures back to 1999 do not show appropriate installations or relicts. The internet sources say that this was a MiG base. But the maximum available length here would be 1,5 km (direction ca. 150°/330°), which would be quite short for jet operations. Comments and corrections to these airfields are welcome. The following terms might help you for your own research on search engines. I'm not an expert for hungarian, so it is without warranty. Corrections and additions are welcome!